Ghanaian Urban Themed Abstract Unstretched Acrylic Painting, "Makola at Noon III"
A man carries out the everyday task of fixing a tire on his car, while in the background, abstract shapes in primary colors suggest a crowded urban street. 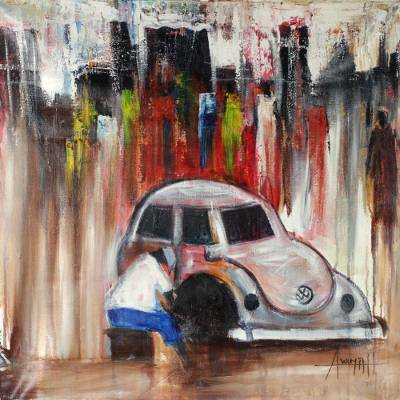 Artist Kofi B. Awuyah's expressionist work is inspired by the Makola Market, one of the biggest market places in Accra, Ghana, where even the perpetual throngs of shoppers and sellers must make way for an automotive mishap. In this acrylic on canvas, the West African painter contrasts the detailed objects in the foreground with the figurative images in the rest of the painting. You can find 'makola at Noon III' by Kofi B. Awuyah in paintings categories such as Cultural Paintings, Cityscape Paintings, Expressionist Paintings, Abstract Paintings and Acrylic Paint Paintings. Enjoy exploring these sections for other Novica treasures.